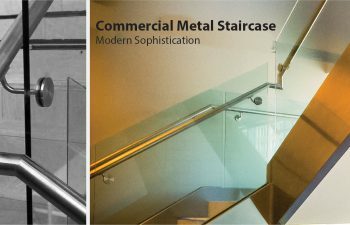 How does a metal staircase complement modern style in commercial spaces? Commercial staircases make a statement. They influence the overall perception of a business when you walk into the building, and that perception can be very important in the eyes of current and potential customers. In today’s world of modern style, a metal staircase combined with innovative design brings a prestigious feeling into any commercial space. Whether your modern design choice is a curved staircase with a glass balustrade, or a metal stair complemented with a handrail system of stainless steel bars, each brings its own aesthetic quality. The options are virtually endless and can help provide you with the exact look and feel you want for your commercial building. Designed and built for a luxury retail store in Florida, the features of this alluring metal staircase include a freestanding double open curved stair constructed of a steel stair carriage. The modern glass and stainless steel handrail system provides a sleek, clean look with an unobstructed view, making this option a beautiful curved stair design choice for a modern metal staircase. Also located in Florida, this avant-garde commercial staircase offers a high-end modern, custom design incorporating glass balustrade panels created with cutting-edge and superior construction. 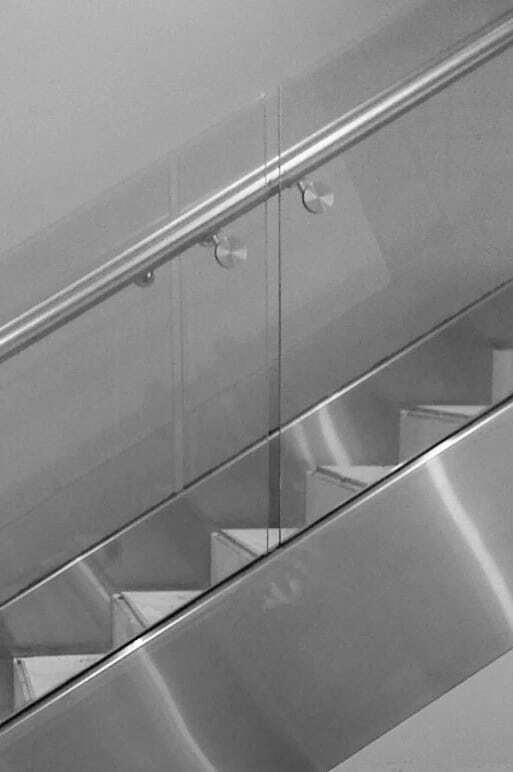 The stair features a stainless steel carriage creating a solid foundation, while the glass is installed with careful precision in the stainless steel stringers creating a clean look with absolute durability. The glass functions as the complete balustrade giving an open, airy feel to the staircase. A smooth stainless steel guardrail system finishes off the stair as required by commercial staircase code. A commercial staircase should make a statement. From traditional to modern, curved to straight, our expert team specializes in comprehensive commercial staircase services nationwide. We are dedicated to meeting schedules and delivering the highest quality products. 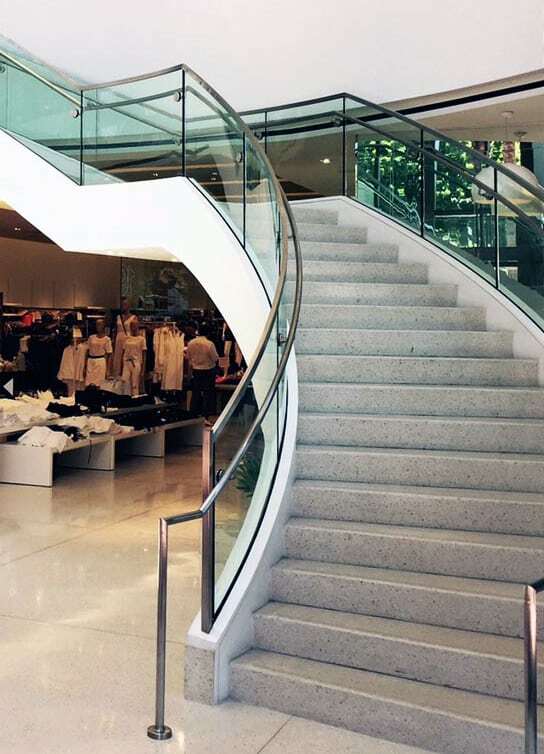 From Beverly Hills to Boston, our team has provided monumental commercial staircases from coast to coast. We know how to balance project cost with aesthetic quality providing an industry leading design team and value engineering services, along with the collaboration to set project parameters and space specifications. Through the utilization of 3D modeling technology we offer detailed submittal packages created by structural design experts who are dedicated to robust project management. With extensive capabilities to design and deliver leading straight and curved staircases and accompanying handrail systems, we promote cohesive design with a flawless fit and finish. Whether you want a metal staircase that is straight or curved, our highly skilled craftsman with in-depth knowledge of commercial staircase codes and regulations will be working for you. We work with building code departments to secure proper permits and approvals, and minimize risk by ensuring each commercial or metal staircase conforms to building codes and your specifications. Turnkey processes ensure on time delivery. Simply put, you get your commercial staircase when you expect it. The commercial metal staircase is constructed in our state-of-the-art facilities, then delivered and installed by our expert craftsman at the job site. The process is seamless, turnkey, and worry-free.